If you work with WordPress.org for a period of time, one of the things you will learn about is ‘Permalinks’. Permalinks can be found unders the ‘Settings’ tab in the WordPress.com dashboard. When I built my first successful blog, I didn’t know anything about permalinks and so the decisions I made in the very beginning to leave it at the default meant I couldn’t really change it later without disrupting my SEO. The default permalink assigns a number to your post and it looks something like this: yourURL/?p=123. in my opinion, this isn’t ideal for search engines and key word searches even if it is nice and short for social media. A popular option is to keep the date in the post, but a major disadvantage to doing this is that it does make it difficult to republish later because it is effectively time-stamped! 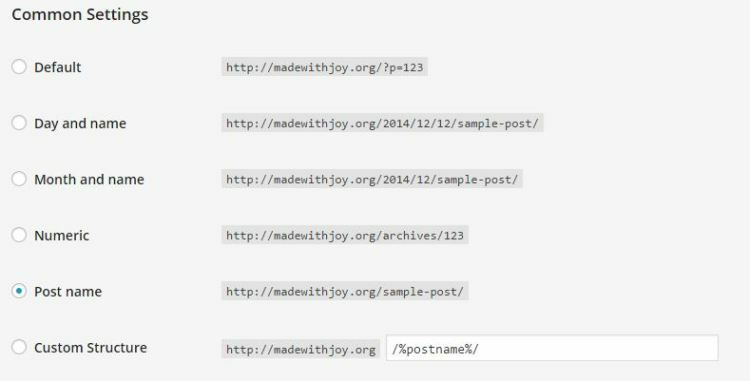 The one I recommend is post name… BUT users beware – a long title of a post = a long URL. In order to fix the URL and make is shorter, simply edit it before you publish it. It is best to try and make it as simple as possible but do avoid single words because each title has to be unique. TOP TIP – Always change it before you publish to social media. Don’t change it after you’ve published it because people won’t be able to access it. Another little tip I’ll give you is that right next to the Edit button and the View Post button is the ‘Get Shortlink’ button. If you are keen to keep your long URL for SEO purposes, you can always get a short URL by clicking on ‘Get Shortlint’ and then use that on social media.